The following list of questions and associated regulations provide guidance on common safety issues related to 29 CFR 1926.501 to 1926.503. 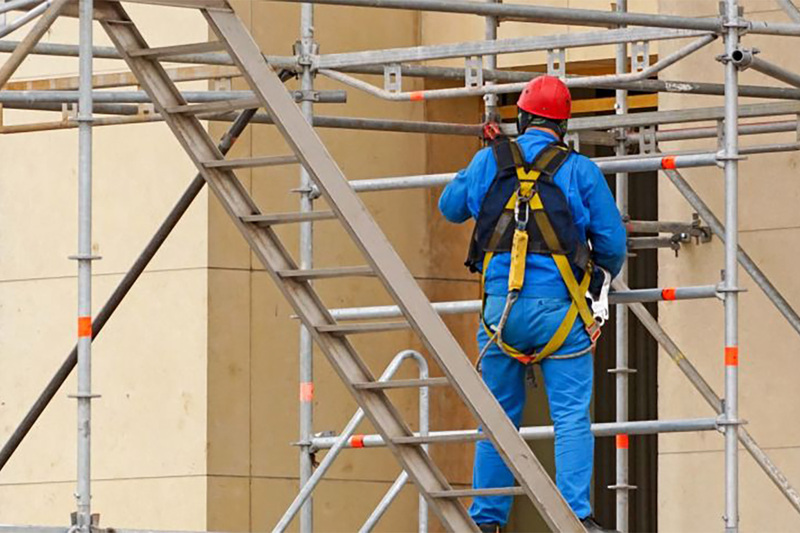 While it by no means covers every area of fall protection in construction, it does highlight some of the more common safety issues and provides a basic understanding of these requirements. Question: Do walking and working surfaces have the strength and structural integrity to support people safely? Question: Are employees prohibited from working or walking on surfaces that are not designed to support them safely? Question: Do guardrail systems, safety net systems or personal fall arrest systems protect employees when they work on unprotected sides and edges of walking and working surfaces that are six feet or more above a lower level? Note: Exceptions are permitted if these systems are infeasible or create a greater hazard. However, a fall protection plan must still be developed and implemented. Question: Do guardrail systems, safety net systems or personal fall arrest systems protect employees during construction of leading edges six feet or more above lower levels? Question: Do guardrail systems or personal fall arrest systems protect workers in a hoist area from falling six feet or more to lower levels? Question: Does a personal fall arrest system protect employees if guardrail systems are removed for hoisting operations, requiring employees to lean through the access opening or out over the edge of the access opening (e.g., to receive or guide equipment and materials)? Question: Do personal fall arrest systems, covers, or guardrail systems erected around holes protect employees on walking and working surfaces more than six feet above lower levels from falling through holes (including skylights)? Question: Do covers protect employees on a walking and working surface from tripping in or stepping into holes (including skylights)? Question: Do covers protect employees on a walking and working surface from objects falling through holes (including skylights)? Question: Do guardrail systems, safety net systems or positioning device systems protect employees on the face of framework or reinforcing steel more than six feet above lower levels from falling? Question: Do guardrail systems, fences or barricades protect employees at the edge of an excavation six feet or more in depth from falling when the excavations are not readily seen because of plant growth or other visual barrier? Question: Do guardrail systems, fences, barricades or covers protect employees at the edge of a well, pit, shaft or similar excavation six feet or more in depth from falling? Question: Do guardrail systems or equipment guards protect employees from falling from less than six feet onto dangerous equipment? Question: Do guardrail systems, personal fall arrest systems or safety net systems protect employees six feet or more above dangerous equipment from fall hazards? Question: Do guardrail systems, safety net systems, personal fall arrest systems or controlled access zones protect employees performing overhand bricklaying and related work six feet or more above lower levels from falling? Question: Does a guardrail system, safety net system or personal fall arrest system protect employees performing overhand bricklaying and related work when reaching more than 10 inches below the level of the walking/working surface from falling? Question: Are employees engaged in roofing activities on low-slope roofs with unprotected sides and edges six feet or more above lower levels protected from falling by guardrail systems, safety net systems, personal fall arrest systems, or a combination of a warning line system and guardrail system, warning line system and safety net system or warning line system and personal fall arrest system, or warning line system and safety monitoring system? On roofs 50 feet or less in width, the use of a safety monitoring system alone is permitted. Question: Do guardrail systems with toe boards, safety net systems or personal fall arrest systems protect employees on steep roofs with unprotected sides and edges six feet or more above lower levels from falling? Question: Are employees engaged in the erection of precast concrete members and related operations six feet or more above lower levels protected from falling by guardrail systems, safety net systems or personal fall arrest systems? Question: Are employees engaged in residential construction activities six feet or more above lower levels protected from falling by guardrail systems, safety net systems or personal fall arrest systems? Question: Are employees protected from falling by a guardrail system, a safety net system or a personal fall arrest system if they are working on, at, above or near wall openings (including those with chutes attached) where (a) the outside bottom edge of the wall opening is six feet or more above lower levels and (b) the inside bottom edge of the wall opening is less than 39 inches above the walking and working surface? Question: Are employees on a walking/working surface not otherwise addressed six feet or more above lower levels protected from falling by a guardrail system, safety net system or personal fall arrest system? Question: When an employee is exposed to falling objects, are they required to wear a hard hat? Question: When an employee is exposed to falling objects, is one of the following measures implemented? Erect toe boards, screens or guardrail systems to prevent objects from falling from higher levels. Erect a canopy structure and keep potential fall objects far enough away from the edge of the higher level so that those objects would not go over the edge if they were displaced. Question: Has a training program been provided to everyone who might be exposed to fall hazards? Question: Is the training program conducted by a competent person? Question: Have individual certification records been prepared that contain the name or other identity of the person trained, the date(s) of the training and the signature of the employer or person who conducted the training? Question: Is the latest training certification for all persons trained available for inspection? Question: Is retraining conducted if a person can no longer recognize the hazards of falling or follow the proper procedures? Question: Is retraining conducted when changes in the workplace render previous training obsolete? Question: Is retraining conducted when changes in the types of fall protection systems or equipment render previous training obsolete? Question: Is retraining conducted if a person cannot use fall protection systems or equipment or has not retained the requisite understanding or skill? All fall rescue programs should be as safe as possible and take as little time as possible to bring a fallen worker to safety. When a fall occurs, any number of factors can create challenges to the effective rescue of the victim. Weather conditions, physical obstacles and the condition of the victim can consume time and create hindrances for rescue personnel. All rescue plans should be regularly reviewed to ensure that the procedures are manageable and realistic in their time estimates. Employers act in their own best interests by implementing the safest and quickest rescue plan and by practicing procedures to maximize preparation for a real emergency. For more information on the suspension trauma and orthostatic intolerance, see After the Fall Event — Preventing Suspension Trauma. 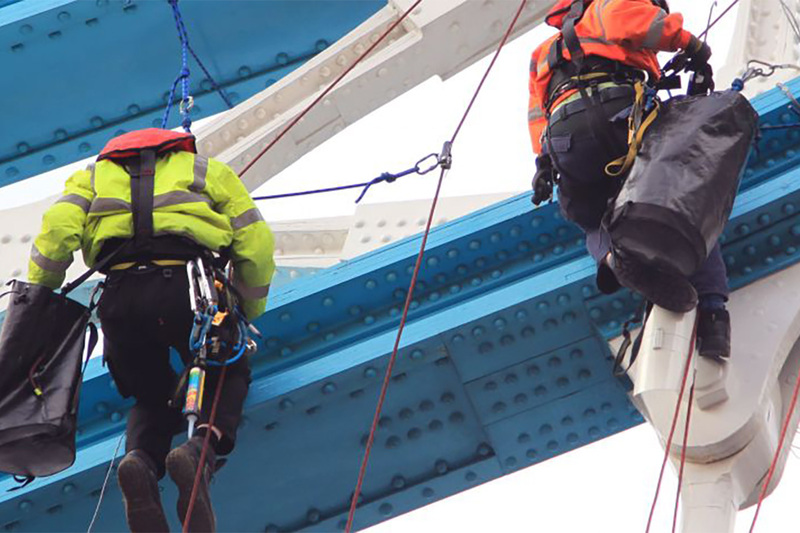 (a) Lifelines, lanyard and safety harnesses must only be used for employee safeguarding. Any of these products that are subject to in-service loading must be immediately removed from service and not be reused again. (b) Lifelines must be secured above the point of operation to an anchorage capable of supporting a minimum dead weight of 5400 pounds. (c) Lifelines used on rock-scaling operations, or in areas where the lifeline may be subjected to cutting or abrasion, must be a minimum of 7/8-inch wire core manila rope. For all other lifeline applications, a minimum of 3/4-inch manila or equivalent, with a minimum breaking strength of 5400 pounds, must be used. (d) Safety belt lanyards must be a minimum 1/2-inch nylon rope or equivalent with a maximum length to allow the user to fall not more than six feet and have a nominal breaking strength of 5400 pounds. (a) Safety nets must be provided when workplaces are higher than 25 feet above ground or water surfaces or other surfaces where the use of ladders, scaffolds, catch platforms, temporary floors, safety lines or safety belts is impractical. (c)(1) Nets must extend eight feet beyond the edge of the work surface where employees are exposed and must be installed as close under the work surface as practical but in no case more than 25 feet below the work surface. Nets must be hung with sufficient clearance to prevent user's contact with the surfaces or structures below. Such clearances must be determined by impact load testing. (d) The mesh size of nets shall not exceed six inches by six inches. All new nets must meet accepted performance standards of 17,500 foot-pounds minimum impact resistance as determined and certified by the manufacturers, and must bear a label of proof test. Edge ropes must provide a minimum breaking strength of 5000 pounds. Lanyard means a rope, suitable for supporting one person. One end is fastened to a safety belt or harness and the other end is secured to a substantial object or a safety line. Lifeline means a rope, suitable for supporting one person, to which a lanyard or safety belt (or harness) is attached. Safety belt means a device, usually worn around the waist which, by reason of its attachment to a lanyard and lifeline or a structure, will help prevent a worker from falling. Body belts are to be used for restraint and positioning only, not as part of a personal fall arrest system. 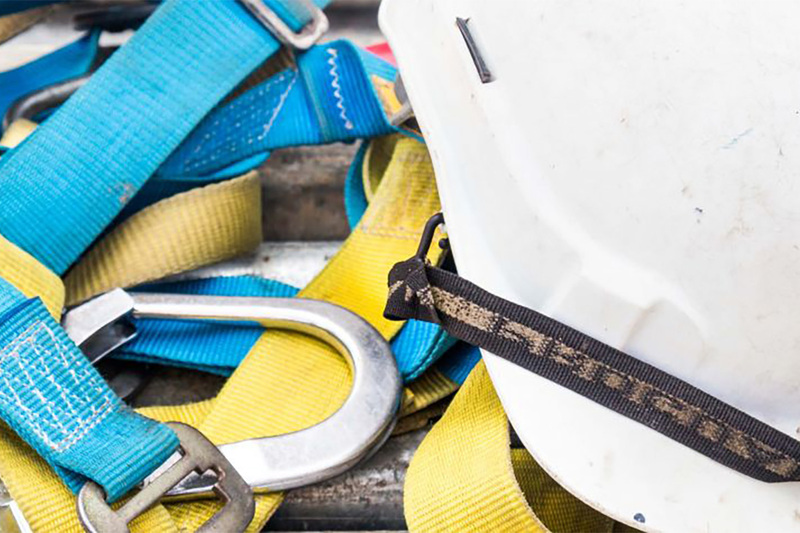 A worker who uses a body belt as part of a personal fall arrest system is exposed to potentially falling out of the belt, serious internal injuries and asphyxiation through prolonged suspension. Q:What is a “competent person”?A:The term "competent person" is used in many OSHA standards and documents. According to the 1926 construction standard, an OSHA "competent person" is defined as "one who is capable of identifying existing and predictable hazards in the surroundings or working conditions which are unsanitary, hazardous, or dangerous to employees, and who has authorization to take prompt corrective measures to eliminate them" [29 CFR 1926.32(f)]. By way of training and/or experience, a competent person is knowledgeable of applicable standards, is capable of identifying workplace hazards relating to the specific operation, and has the authority to correct them.